It was destined to be an iconic image: a small girl holding a teddy bear in a white dress marked by blood splotches with the ruins of Aleppo behind her. But according to Egyptian authorities, it was also a set-up, shot hundreds of miles away in a different country. Egypt’s Interior Ministry has revealed on its Facebook page that it arrested a group of five people caught in the act of producing images purportedly depicting scenes of suffering in Aleppo that they had planned to pass off as real pictures from Syria. “In a conversation with them, the suspects revealed that they had shot a series of scenes to be spread on social media, as actual pictures from Aleppo,” said the ministry, which posted a video of the arrest, and interviews with the suspects online. 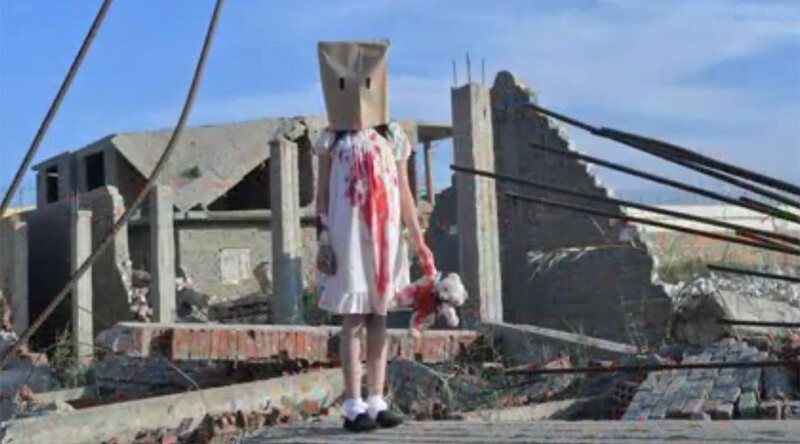 The stand-in for Aleppo was “the ruins of a house that had been slated for demolition by the authorities some time earlier.” The blood was obtained from a “tin of red paint” that was liberally smeared on the girl, her fake bandages, and her stuffed animal. The girl herself was known to the photographer beforehand, and came to the session with her mother, the photographer, and three other local men. Mustafa is being detained in jail for an initial four days, while the others have been set free, and Ragd has been returned to her guardian. While it is unknown whether Mustafa’s staged photo would have gained social media traction, vivid photographs – some of them fake – have been powerful tools in shaping public opinion since Aleppo was re-captured by Syrian government forces earlier this month. The most notorious hoax picture, which has been shared thousands of times on Twitter and Facebook, features a girl running through a debris-filled street. The caption reads “Girl running to survive, all her family have been killed. It’s not in Hollywood. This real in Syria.” In fact, the image was cut from a 2014 Lebanese pop video. Another video, called “Executions have begun in the middle of the street in Aleppo,” which has also been widely shared, depicts supposed government forces allegedly taking out retribution on civilians. In reality, the video dates back from 2012, and contains unverified images.